The Subversive Archaeologist: Throwing in the Towel Thanks to Pinnacle Point, South Africa. As If. Throwing in the Towel Thanks to Pinnacle Point, South Africa. As If. At home. Under the weather. What else to do but watch the news ticker. It is ablaze with the latest news from Pinnacle Point in South Africa. The first word I had of it was a headline about this piece, just published, in Nature. In the article, long-time acquaintance and Mousterians 'R' Us advocate Sally McBrearty extolls the collection of more evidence for modern human behaviour at around 70,000 years. Sally was commenting on a Letter to Nature also published electronically yesterday. As you know from reading the SA, there are plenty of claims out there for modern human cognitive abilities or behaviours, or both, going well beyond 100 ka--blade industry at Kathu Pan 1 and Qesem Cave; hafting with bitumen or birch tar, and so on. However, as you also know, I've been critical of a great many of them. Yet, according to the age estimates for unequivocally modern human activities at places in southern Africa, such activities are occurring at an age anywhere from 30 ka to 60 ka earlier than they do in Europe and southwestern Asia. 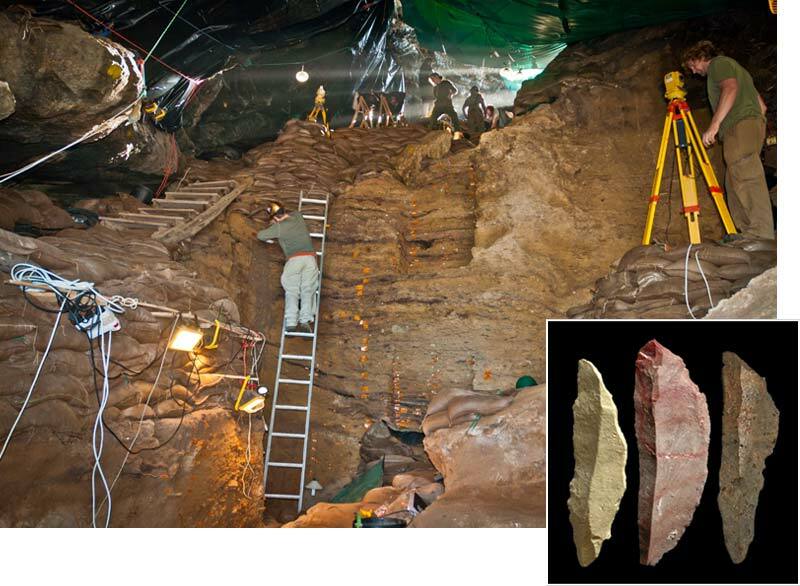 For example, finds of decorated ochre and pigment processing 'kits' at Blombos Cave ca. 75 ka. In today's piece by Brown et al. we're hearing about use of the bow and arrow ca. 70 ka [I haven't had the time to examine the actual evidence for the claim other than to note that they refer to the microlithic portion of the assemblage consisting of small backed blades.]. This of course is one of the inferences frequently made for the kind of stone tools comprising the Howieson's Poort phase of what in Africa is called the MSA (Middle Stone Age). PP5-6 excavation. Deeply stratified and sharply inclined, much like a cone of talus [Credit: Erich Fisher; (inset) Simen Oestmo] © Science/AAAS. I've previously said quite a bit about these early dates, here and here. However, this latest publication, and an earlier one from the same [or similar] group of authors, published in Science a few years back claims [and at this point I have no reason to doubt them] that they have evidence of heat treating lithic raw material to make it more workable, between about 70 ka and 164 ka! This would be a great discovery even if a mere 30,000 years old. Unfortunately for me, these two inferences--of bows and arrows and heat treating--leave me with a new emotion--dismay--at the precocity of the ancient southern Africans. That's because these microliths and heat-treated lithics from Pinnacle Point derive from a part of the Pinnacle Point locality known at PP5-6, which is generally described as a rock shelter. Pinnacle Point PP5-6. Tarpaulin covers the excavations. © Science/AAAS. In my earlier rantings I suggest that using Optically Stimulated Luminescence (OSL) age determinations drawn from buried cave sediments may be the culprit, artificially overestimating the age of these patently modern human assemblages. That's because there's really no way of knowing, a priori, whether or not an individual quartz sand grain had ever been exposed to the sun, much less for how long. [This, you'll remember, is a crucial assumption of the technique.] It's this uncertainty that causes OSL experts to undertake what appears to me to be a complex series of calculations and extrapolations designed to overcome the potential shortcomings of the technique. However, a rock shelter is a bit stickier. Presumably a rock shelter would be exposed to sunlight year in and year out, and thus you might imagine that any quartz grain that came to rest there had been exposed to sunlight long enough to have its 'clock' set to zero [unless, of course, that grain had been stripped from older deposits, redeposited in the rock shelter and immediately covered by sufficient material to preclude its being affected by the sunlight thereafter--like, perhaps, at night]. Now, after about a day and a half of off and on Googling I've been able to sight nothing written that describes the geomorphic history of PP5-6. Nevetheless, I have a hypothesis that will allow me at least some peace of mind. 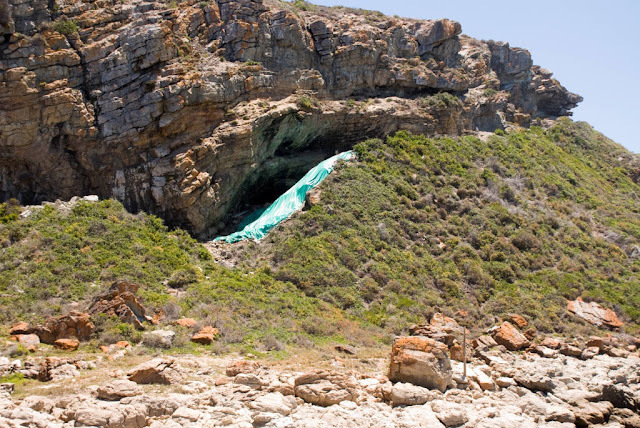 Given its proximity to a series of true caves at Pinnacle Point, and given its location at the edge of the escarpment that contains those caves, it seems highly likely that, while exposed today, the sediment accumulation at the site occurred inside a cave in which the roof and shoreward wall have subsequently collapsed and migrated down slope. So, unless I'm mistaken, I have no more reason to accept these early dates from the Pinnacle Point locality than I do the others from caves in South Africa. I know that the Very Serious Palaeoanthropologists like Curtis Marean will simply scoff at my scepticsm. Nevertheless, one can't help but wonder. And one day, perhaps, someone will try to directly date a piece of bone from one of those amazingly old stratigraphic units and Voila! Prof. Marean talks about this on 'Material World' BBC program yesterday 08.11.12. Available as Podcast or on BBC iPlayer.